Details relating to the German Commemorative of 2012. This is the sixth of the German series of commemorative coins representing the provinces of Germany. This one represents Bavaria. Chosen to represent Bavaria is the romantic, fairytale castle Neuschwannstein. It is in Southern Bavaria near the town of Füssen. The construction of the castle commenced in 1869 at the instigation of Bavaria’s eccentric King Ludwig II. The castle supposedly represents a middle ages knight’s castle. The image of the castle in the inner circle is very realistic and shows the view from the east that visitors see when walking up to the castle. The name of the province BAYERN (Bavaria) is shown at the bottom, while the initials of the designer are seen at nine o’clock and the mint mark is between two and three o’clock. 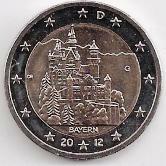 Return from German Commemorative 2012 to euro coin collector.